Conor McGregor takes on Khabib Nurmagomedov at UFC 229 in Las Vegas and bookmaker 888sport is offering enhanced odds on either fighter to win! Find here how to claim 7/1 Khabib to win or 11/1 McGregor to win! Max bet £5. Khabib Nurmagomedov is the unbeaten champion as he has destroyed everyone who he has ever faced - 26 fights, 26 wins, eight by KO and eight by submission. Conor McGregor makes his long-awaited return to the octagon after 2 years. The Notorious lasted 10 of the 12 rounds against Floyd Mayweather, on of the greatest boxers of all time, in what has been called "the Money Fight". Who will win the fight? Conor the striker or Khabib the wrestler? Register a new account with 888sport before the start of the fight and claim 7/1 Khabib or 11/1 McGregor to win the bout - Max bet £5!! New customers only. £10 minimum deposit using promo code "888ODDS" required. Qualifying bet must be placed at the normal odds Min bet £5, max bet £5. Extra winnings paid in FREE BETS and added within 72 hrs of qualifying bet settlement. Free bet stakes not included in bet returns. Free bets expire 7 days after credit. This offer may not be combined with any other offer. Deposit balance is available for withdrawal at any time. General deposit method & withdrawal restrictions apply. T&C’s Apply. 18+|Gamble Aware. The Dagestani has outstruck his opponents by an average 116.75 strikes over his last four scraps. He owns size advantage and is much stronger than his opponent on the ground. Khabib has the best cardio and puts relentless pressure on his opponent. Normal odds on Khabib to win? 15/8 at maximum! 7/1 with 888sport through this page! He laster longer than many expected against Mayweather, showing improved boxing skills. Both Michael Johnson and Al Iaquinta exposed Khabib for his poor footwork and guard when trading strikes. The Notorious only failed to finish Nate Diaz and current featherweight champion Max Holloway during his 10-fight UFC career. 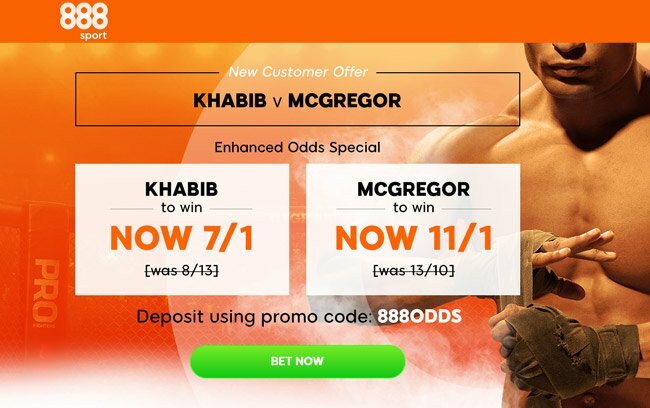 888sport are offering all BetAndSkill readers a double enhancement on Khabib vs McGregor, click here to get your price boost right now! Online bookmakers are offering tons of enhanced odds offers on this fight We have collected the best promos..
Get 9/1 Conor McGregor to beat Khabib Nurmagomedov by KO, TKO or DQ. Max bet £5! Promotion is valid until the fight starts. "Get 7/1 Khabib or 11/1 McGregor to win at 888sport. Max bet £5!"